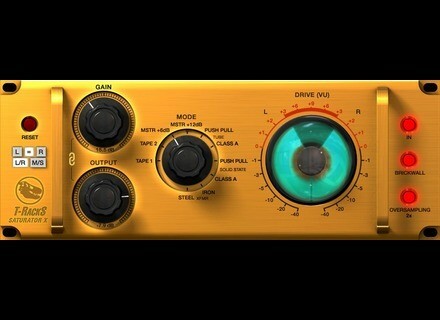 Saturator X, Software Distortion/Overdrive from IK Multimedia in the T-Racks series. The new T-RackS Saturator X was designed to provide recording engineers, mix engineers and sound designers with a comprehensive tool for adding special saturation effects from classic analog recording gear models. Saturator X is a T-RackS digital signal processor module that claims to impart the color, flavor and saturation effects of classic analog audio processing gear to digital recordings. It provides simple controls that let the user select from a total 10 different modes of saturation effects spanning the panorama of classic analog gear. Saturator X can be used as a plug-in on individual tracks or on the master fader in your DAW. From tape to tube to transformer to transistor, T-RackS Saturator X provides you with multiple saturation options. Featuring 10 individual styles of saturation and distortion from gentle, subtle hint of drive from a slightly overdriven transformer to the full-on, aggressive driven tube sounds. T-RackS Saturator X provides 10 saturation modes that aim at delivering the behavior of the analog hardware component and circuitry or medium, selected for their special or unique character. The modes include replicated models of classic analog processors, with 2 “tape”, 2 “master soft saturation”, 2 “tube”, 2 “solid state” and 2 “transformer” modes to choose from. T-RackS Saturator X is now available from the IK Online Store for $/€79.99, or from within the T-RackS Custom Shop for $/€79.99 or 80 Custom Shop Gear Credits. T-RackS Saturator X may also be downloaded from the T-RackS Custom Shop and operated as an unrestricted demo for a period of 14 days. Heavyocity Ensemble Woods Collection Heavyocity introduces the Ensemble Woods Collection, a library of percussive wood samples part of the brand's Master Sessions series. Mixvibes' Remixlive goes v1.1 Mixvibes' Remixlive gets an update that introduces new features such as Inter-App, Audiobus, SoundCloud export & Retrigger mode. Ueberschall Classical Guitar Ueberschall presents Classical Guitar, a new sample library based on nylon string guitar loops.